There are days when I think it could not have been real. Then there are days when it is so real I want to pretend it never happened. And there are days when I want to try to find those boys, look them up on the internet. Their names have been forever engraved on my heart. I do not need even a moment to come up with the names, the faces, or even the wounds each one carried. Even though at this stage of life I sometimes cannot remember my own telephone number or where I parked my car. I feel tears roll down my cheeks each time a float depicting the raising of the flag at Iwo, or a caged mock prisoner of the Vietnam era passes in a parade. My eyes sting and my throat tightens each time I see a soldier at the wall, weeping. These embers of war are mournful reminders that yes, it was real, so real that even after all these years it cannot be forgotten. When I look into the tortured eyes of a Vietnam veteran, or listen to the stories that often take years of smoldering in the subconscious before they can be put into words, I know the reality. It is those who return alive, but deeply wounded in their souls who often suffer the most from war. And the end result is always the same. The end result is always more taxes, more widows, more debt, more man-made limbs, and the deep sorrowed embers that can be ignited in unexpected moments. While those in power drink their wine, add up the profits, celebrate, congratulate each other, or prepare for the next conflict, others suffer in silence. I hope this small effort will let them know we care; and to somehow aid in the quest for peace in our world. By keeping them locked away. A memory and suddenly the poem flickers. One gardenia, an orchid, or a dozen red roses. A poet breathes upon the ash . . .
Beatrice O'Brien, poet, workshop leader and director of Poets Theatre for over 20 years. A volunteer as leader of a Creative Writing Project for Veterans in rehab for 10 years, director of several Writer's Groups, including the Writer's Roundtable in Hornell, NY. Widely published both nationally and internationally, winner of several awards, including a first for a national chapbook contest by Forum Press and several first place awards in small press journals. Served as a US Navy Nurse, World War II, married to George O'Brien 69 years, mother of six children. Author of ONE TRACK, a Railroad non-fiction narrative and several other books and chapbooks. 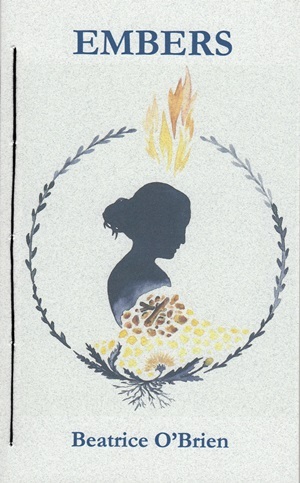 EMBERS is a 48 page hand-sewn paperbook with spine - $12.00.